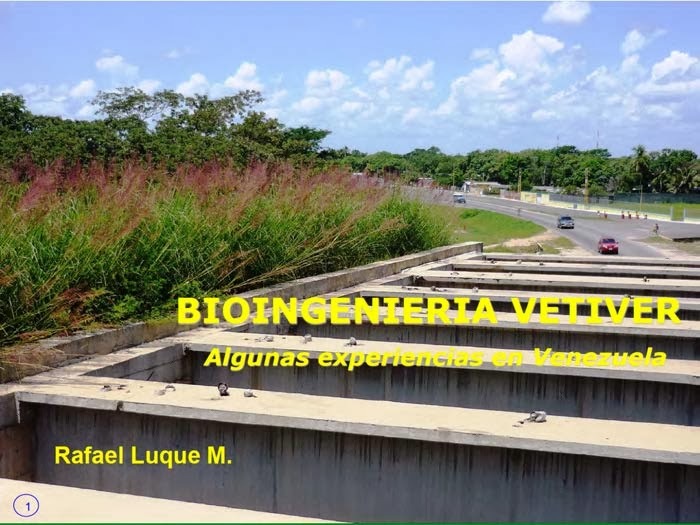 Reviewing the papers and presentations delivered at the October 2013 Vetiver Conference in Colombia there is one on Bioengineering in tropical Venezuela that should be read. (Non Spanish readers should use Google translate or just look at the presentation). The paper and presentation were made by Rafael Luque whose company "Vetiver AntiErosion" has been in operation for more than 10 years now and has applied vetiver for a wide range of engineering and phytoremedial uses including, road stabilization, gully control, bridge abutment protection, river bank stabilization, protection of electricity pylons, and rehabilitation of mine land. Some of the applications can be considered "extreme". In all cases the quality of application, the quality plants and the results have been very good. Rafael will be the main resource person at an up coming Vetiver workshop in Brazil from April 24-25, 2014. Brazilians should take the opportunity to attend.